The Kukaklek River is another very popular fly fishing destination in Alaska. People come to the various rivers from all over the world to catch the large Salmon that run these rivers each year. The Fly fishing can be amazing during these runs, and the season is short so you need to plan your trip early while guides are still available and the lodges still have accommodations available. The Kukaklek River, or the Big Ku as it is commonly named begins at Kukaklek Lake and ends where it meets the Novianuk River and forms the Alagnak River. 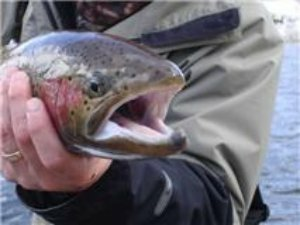 The Big Ku is widely known as a trophy trout stream in one of the greatest settings in the world. Most of the fishing on this river is done by wading but you will also find guides in jet boats anchored in some of their favorite locations with anglers fishing from the boat. The fishing for trophy’s can be quite exciting either with deep sinking lines or while floating a dry. You may also stumble upon some Arctic Grayling that will also put up a great fight. The Little Ku is the stream that flows into the lake and it offers up some exciting fishing as well. This is a narrow stream that will require smaller gear, and it will require a small hike upstream to some of the best fishing spots. The fish are visible and when hooked they will provide an exciting adventure while trying to land it. Like most Rainbow’s these large 5-7 pound fish are not afraid to go airborne. In the summer and during the fall you will see a nice run of Dolly Varden as well as a large run of Sockeye Salmon returning to the stream to spawn. If you are looking for great trout fishing this would be the place to go in Alaska. The fly fishing is amazing, the size of the river and streams are easier to wade than most and there is a great supply of large fish in these waters. Then add the scenery and you will understand why this is such a good fly fishing destination. There are many Alaska fishing guides in the area that would see to it that you have a great experience. Leave the Kukaklek River and see other rivers in Alaska.